A strange and naïve girl with a kind heart, never wanting to see someone suffer or get hurt. She is very innocent and dedicated. It is also noted that she is a beautiful singer. Despite her role as the titular character, she is a bit of an enigma within the series, as her origins have yet to be explained. She seeks to heal the heartaches of others, resulting in the filling up of a mysterious bottle called a "flask" with the suffering of those people's hearts so that someday she will be able to go to a certain place that she really wants to go. It has been implied that she came from another dimension. She seems to have no memories of her past. Her only restriction appears to be that she cannot fall in love with anyone she heals the heart of. Curiously she also seems to not be allowed to take off her hat in public either, though this has yet to be addressed further. Kobato has a very cheerful and enthusiastic outlook in life and her wanting to aid others in need is very heartfelt and sincere. However, she can also be clumsy, rather clueless, and rash with her actions, and often trips over her own feet, much to Ioryogi's annoyance. Currently she works at the Yomogi Nursery run by Sayaka, alongside Fujimoto, where she got a job as an assistant not long after starting her task. Recently, Kobato seems to have developed some sort of feelings for Fujimoto. In Chapter 19.5 she admits that she likes Fujimoto but cries, knowing that she was not allowed to fall in love. In episode 15 it's mentioned by Ioryogi that maybe Kobato is recovering her memory back, this let hint that previously Kobato lost her memory. The only time she took off her hat was on episode 23 in the anime.It was revealed that she was actually a wandering soul, having no memories when she first came. When removed, a crown was seen above her head. In Chapter 21D it is revealed that the spirit Iorogi (Ioryogi's original name) loved is an alternate Kobato. 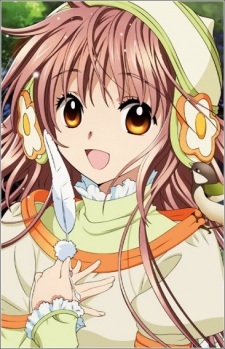 The human Kobato was accidentally killed during the conflict Iorogi led between the Otherworld and Heaven. In order to save her life, the angel Kobato enters the human Kobato's body to save her, since they have the same soul.